We all know that our golf shoes were created intentionally for the golf course. Whether you own spikeless or spiked golf shoes, it’s important that you only use your favorite footwear on the green. Reason being, you could actually cause the outsole to wear quicker, causing the actual footwear to break down quicker. Now, you might be wondering, do you need to start carrying your golf shoes with you to the golf course? Of course, not! We have a special product to share with you! Rather than holding onto your footwear, placing them in a plastic bag, or a gym bag – why not consider a golf shoe bag? Here is a handy invention that can provide golfers with an opportunity to safely transport their precious, and often experience, footwear. The best part about these products is that they are quite spacious and come with numerous pockets. As we will share, these products are quite valuable, giving golfers more opportunities than they imagined. Let’s jump in and explore the first product on our list. This brand excels in the industry as one of the highest quality rated golf brands. They are primarily known for their quality golf gear and golf shoes. Therefore, we expect this product to be of the best material quality and design. As the first product on our list, we want to talk about the FootJoy Genuine Golf Shoe Bag and two features individuals can take into consideration. This product has a very unique design feature that also comes in handy. 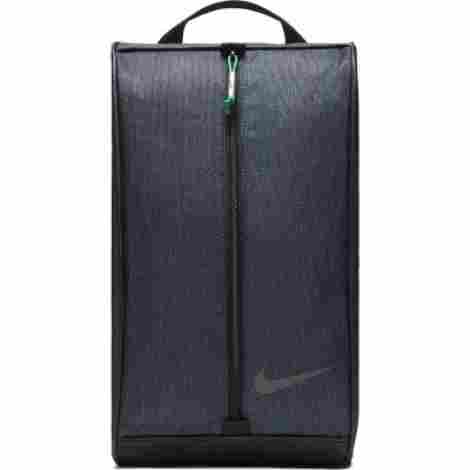 If you do not want to be greeted with an odd scent when opening up your shoe bag, then this is the best shoe bag for you because of the mesh ventilation system. The mesh ventilation system of the bag allows for the shoe to breath and any odor will be able to leave the bag and not get trapped inside of the bag. This product has a high-quality full zipper design. The full zipper design allows for individuals to easily be able to zip up the bag and use the bag as it is intended. With that said, the zipper is very durable, and individuals can expect the overall polyester material of this product to be of the best and most effective design quality. To discuss the price and value of this bag, it is important for individuals to recognize that this bag is made from a bag that is very high quality. With that, this product is a five-star bag with plenty of positive reviews touting how simple it is to use and carry. It is made of quality materials, it has a moisture and water-repellant liner on the inside, and it happens to be highly durable as far as stitching and quality. For the price, we recommend this product! The zipper is highly durable. The carry strap is reinforced stitching. This brand is known for creating some of the highest quality gear as far as carrying products. From stands bags to shoe bags, they have designed some of the most durable and touted products that we have come to know and love. As product number two, we want to talk about the modern golf shoe bag from the CaddyDaddy brand and what individuals can expect if they are considering this product. Let’s begin! The construction material of this particular bag is of the best material quality. In fact, the material is known as the material that many tactical-wear products are made from. Can you guess it? It is Nylon! This product is made from 600D Nylon, which is common in the tactical field because it happens to be high quality, highly durable, rip and tear resistant, and even water-wicking. With that, individuals can expect the material to be of high quality. This next benefit of this product is one reason we love and tout this brand. Not only do they create their products to be high quality and durable, but they think of the most convenient design benefits. This item, for instance, is designed with an easy grip handle that is made of rubber. Therefore, not only is it fully reinforced with quality stitching, but the rubber handle ensures maximum grip and quality, making it easy to carry the bag anywhere. To discuss cost and value for this particular bag, we think that individuals will appreciate the many design benefits of this product alongside the very unique and modern design. With that, we can say that it is well worth the value considering it is higher durability and quality than the last product on our list, but also double the reinforced design and less costly. If you want premium value, this is the shoe bag to get! Internal divider to keep the shoes scuff free. Three pockets for additional storage. The fabric is highly durable. Large opening for easy access. The bag is a bit large. It is time to talk about a brand that is known the moment an individual speaks their name. Callaway is known across the globe and golf community as one of the premiere signature golf brands to consider. Their design elements, quality features, and overall value are found not only in their products but their customer service. So, this next bag is product number three and we want to talk about two features from the Clubhouse Collection Shoe bag by Callaway. The grip of this product is made of one of the highest qualities and most durable materials. This material is highly known I the sportswear industry for its elasticity, moisture-wicking benefits, and overall, it’s plush comfort. We are talking about Neoprene. The material of this bag is a full neoprene handle that is designed as a comfort grip handle, so it is easy to carry and does not cause any blisters or discomfort. This product is designed with side air vents! The side air vents of this bag allow for the inside of the bag to breathe appropriately, so the shoe and the bag do not soak in any bad or foul odor. With that, the side air vent is made of quality rip-resistant mesh, which is highly durable and allows for the product to also not get hot on the inside. With that in mind, the overall bag is also very easy to wipe down, wash, and clean in the case that odor does build up or it gets dirty. In discussing the value of this bag, we are actually surprised that it does not cost more. The reason being is that this bag is of the highest material value and the durable design is very high quality. Individuals have mentioned that the bag is a bit small, but the overall design is efficient. We also have to keep in mind that this is one of the leading brands in the golf industry, so the price is extremely affordable considering the value they add to the marketplace. The grip does not leave blisters. Side air vents for breathability. Easy glide zippers and easy access opening. Individuals have mentioned it is a bit small. This next bag is a bit different than the ones we have shared so far. However, it is still a quality bag. This product is made to be sportier and more modern and less minimal. The Athletic Golf Shoe Bag is a quality shoe carry item that allows for excellent ventilation, quality carry, and even has extra pockets so individuals can carry even more items. With that said, we want to share that this product is a full five-star bag with over one-hundred reviews to consider from happy customers. Here are two benefits of this sporty carry bag. This carry bag actually comes with extra-large side pockets. The side pockets are designed for individuals that also want to carry extra items. For instance, if you are a golfer, you can include more golf balls or even a shirt inside the extra-large pocket. The pocket is fully separated from the inside main pocket so no item in the side pocket will ever get dirty because of the shoes. With that, the inside pockets are water-repellant as well. One of the highest rated benefits of this product is the fact that the fabric is made of 600 Denier Polyester. With that, the polyester is built to last, is highly durable, and extremely high quality. Therefore, individuals can expect this item to be of the best value because it can withstand all weather environments alongside mud, dirt, and rain. Overall, this level of quality is found is most high-quality tactical gear or rip-stop fabrics. In discussing price and value for this item, we can see why this product is a five-star item. This item has the perfect trifecta to think about; quality, durable, and easy on the wallet. For less than twenty-dollars, an individual can buy one of the highest rated shoes carry bags available today. The overall design is comfortable to carry, the opening is large enough for large shoes, and to our surprise, they even offer this product in two color choices, pink and black. Overall, we highly recommend this item. Perfect to carry shoes for all occasions. Side pockets are very large. The opening is not as large as other bags. We could not have a list of the best carry shoe bags without including the top-of-the-line brand for sportswear shoes. We are talking about Nike. If you know Nike, then you know that they excel in creating top of the line products and quality designs. Therefore, we only expect the best from this next product. 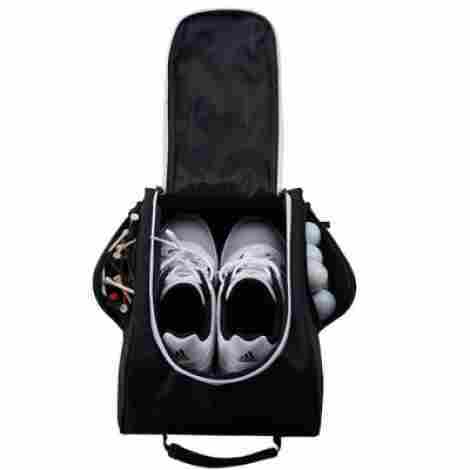 We want to share the Sports Golf Shoe Tote that they offer and two design benefits to consider this quality and dynamic product. The exterior of this particular product is made of a 600D Polyester fabric. This fabric, as we have mentioned before, is made of a densely woven design that is very high quality and highly durable. More so, this fabric happens to be moisture resistant, moisture-wicking, mud, and dirt resistant and is highly aesthetically pleasing. In fact, the fabric is designed with a feathered print modern aesthetic design that is of the highest material value. This product also boasts an easy to grab handle that is very high quality. The handle is made of the same highly durable material and happens to be enhanced and stitched for quality and durability. With that in mind, the handle is convenient to carry and very easy to use. With that, the overall product design is of the best-reinforced qualities and individuals can expect a highly durable product. To discuss cost and value for this item, we want to share with our audience that this brand has a large selection of carrying bags, duffel bags, and more. With that, they have designed this to be of one of the highest quality material values and benefits. With that said, the design is comfortable, easy to use, and the overall zipper design is smooth and durable. For the price, it is well worth it. As a last feature and benefit, this product comes with three color choices to choose from. Highly modern and smooth exterior design. Grab handle is very convenient. Feathered print for a modern print effect. The zipper is in the middle and it may be odd to place shoes inside. This next brand is known as one of the premiere shoe brands in the industry for their modern designs, high-quality material fabrics, comfort qualities, a large variety of products, and of course, their three-stripe designs in virtually every product. Do you know who we are talking about? 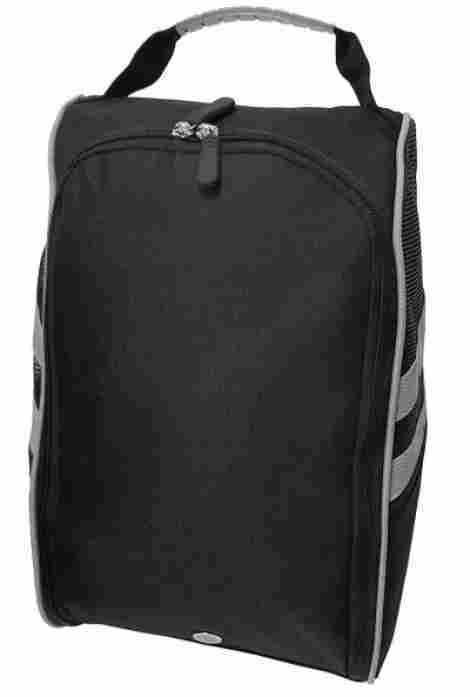 We want to share with our audience the Adidas 3-Stripes Shoe bag and two features of this product! This product is designed a bit differently than other bags we have shared so far on our list. This bag actually comes with a top shoe insert design that allows for individuals to easily be able and insert any pair of shoes inside of the bag. With that, the inside is made to be durable, moisture wicking, easy to clean, and even has ventilation is different areas so the inside of the bag does not soak in any odors. One of the highest quality benefits of this product is particular attention to detail. The attention to detail of this bag includes the ventilation space, the quality and smooth zipper closure, the 100% polyester durability, and even the 3-stripe print design that is common with this brand’s branding. Individuals can expect this product to be of the best material design and durability, allowing for plenty of years of wear and tear. To discuss price and benefits for this product, we can say that the material of this bag is a high quality 100% polyester material that is durable and very high quality. With that said, the storage bag is designed with quality ventilation and the overall capacity is enough for even large shoes. Overall, the price is a bit more costly than better bags, but if you like the design, it is worth it. Let’s talk about the pros and cons. The design is very awkward. As the next product on our list that we want to share with our audience, we are eager to talk about the convenient golf storage bag from this brand. This brand is known for their material expertise and highly durable products. So, we had to include them. Let’s talk about the Izzo Golf Shoe Bag and two features individuals can expect from this comfortable, quality product. Here is benefit number one! One of the most convenient design benefits of a product such as this is the fact that many brands will design the shoe carry bag as fully water-resistant and this is a perfect example. This product has a water-resistant inner lining that is designed for individuals that want to use this product during the rainy day season. 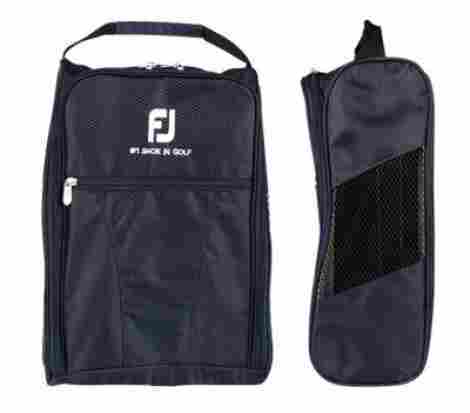 If you want a quality shoe carry bag that is designed for the rainy golf course days and you want to keep your wet shoes in a place where it is easy to carry them without getting dirty, this is the bag to get. Alongside the moisture wicking and water-resistant design, individuals can expect that the shoes and inside of the bag will not build up any odor due to the ventilated side panels. 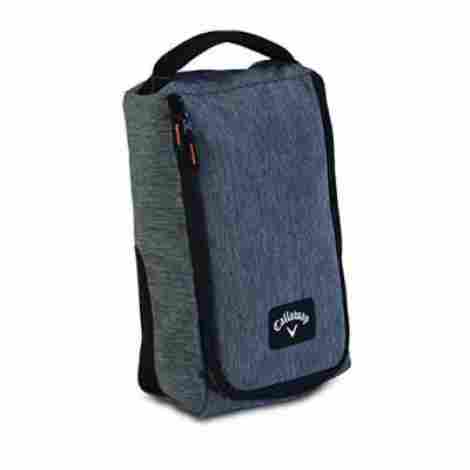 This product is designed with ventilated side panels that are very high quality and designed to allow airflow and breathability to travel through the bag. With that, the side panels are highly durable and well-stitched, allowing them to be rip-resistant. To discuss cost and value for this particular product, it is important for individuals to recognize that this brand is one of the most trusted in the game but also has a very affordable price. Do not let the cheaper price sway you from not purchasing this product, it is very durable and well-functioning. Although the design is less aesthetically pleasing than other brands, it still comes in handy and does the job of carrying your shoes very well. Convenient and easy to carry design. Inner pocket allows for easy carry of spare spikes and tools. The zipper design is not high quality. We are eager to talk about a brand that excels in the area of bags, luggage, and golf bags. In fact, they have designed some of the worlds leading premium bags and luggage with their innovative use of material qualities and attention to detail. Here are two reasons why individuals should get to know and trust the Ogio brand. This is their 2018 Shoeester Golf Bag and it is of the highest premium value and even has five stars to match. Here is benefit number one. The interior of this brand is actually made from a carbon base that ensures the highest quality durability, material design, and aesthetics. More so, the carbon base interior is designed to be anti-microbial. So, individuals can expect that no bacteria will build up inside of the shoe bag, the interior is easy to clean, it is ventilated so no odors can build up, and the overall design is of the highest quality. Another incredibly beneficial design element of this product is the fact that it is very easy to clean. This product is easy to clean, hose out, and wipe clean. With that, individuals can soak it and wipe it dry and expect the product to still be of the highest material value. Alongside this, everything from the exterior, to the bottom, to the carry strap, to the zipper, and of course, the interior is of the highest material value, guaranteeing maximum performance and quality. To discuss the cost and value for this item, we can say that individuals will find this brand to be of the best material value. Their products are designed to be durable, high quality, high functioning, and their customer service are superb. 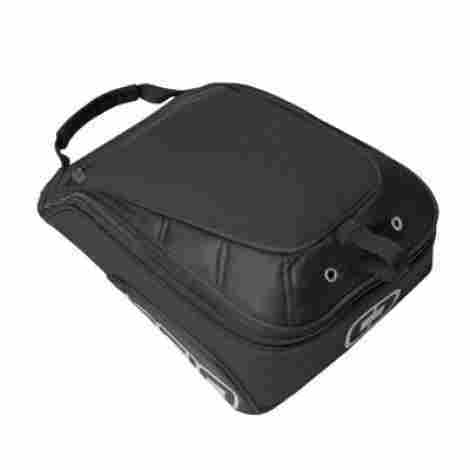 With this, this product is designed to be fully functional and even has a zippered accessory pocket, so individuals can carry added items if they need to. The price makes this the costliest on our list so far but it is due to the brand’s aesthetically pleasing use of materials alongside design details. High quality carbon based anti-microbial bag. Quality design and highly appealing. This next product on our list is an expert shoe bag for individuals that not only want durability but also want style. In fact, the primary unique element of this product is the overall design style, which we will talk about further in the first feature. We want to share with our audience the stylish and high-quality Team Golf NFL Shoe Bag and two features to consider this product. Let’s begin! So, this is the most unique element of this product. 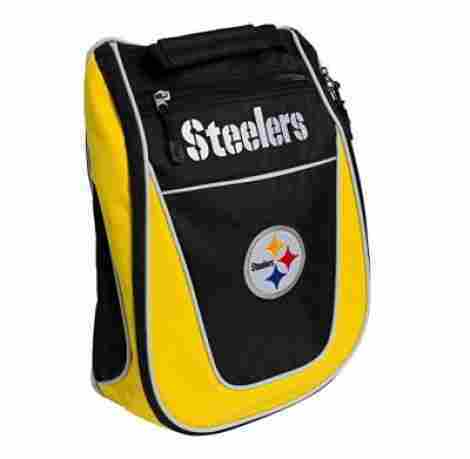 This particular bag actually comes with an NFL Team choice design. Individuals can pick their favorite team ranging from the Houston Texas to the Seattle Seahawks. With that, the color and the logo will change according to the particular bag that an individual chooses. 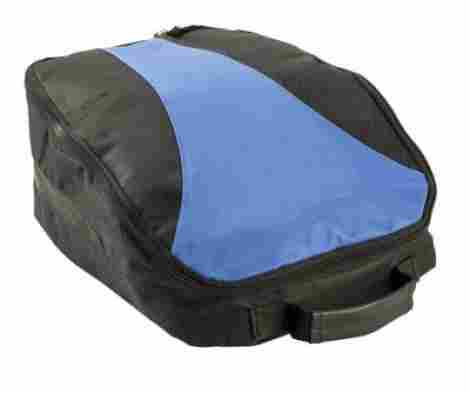 The design of this product features a full zipper design opening that is very high quality. The zipper is an easy to use and smooth glide zipper that allows individuals effective use over the product. With that, this item also has an extra pocket for easy access to additional storage. In discussing the price and value for this item, individuals can expect the carry bag to serve as a regular everyday bag. With that, individuals can expect this product to be very durable and highly efficient to carry. The overall large zipper interior design makes it easy to place the shoes and also the strap is very high quality, making it easy to carry. Simple NFL Golf shoe bag. Stylish and plenty of choices to choose from. Easy to carry comfort strap. More costly than premium brands. As the last brand on our list, we wanted to share a brand that is known in the sportswear industry as one of the highest quality brands to consider. They are known for their expert quality material products, alongside unique and universal design elements and overall quality service and value. 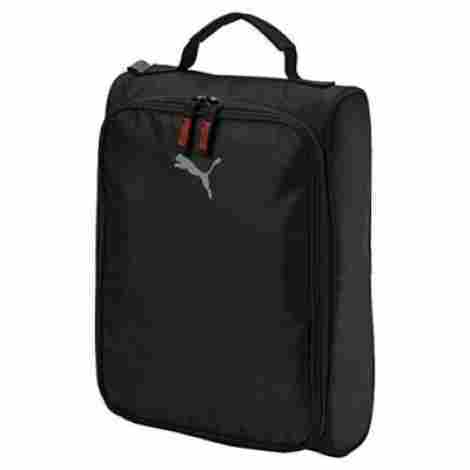 We want to talk about the Puma Golf Shoe Bag and what individuals can expect from this simple carry bag. This product is designed with a high-quality material fabric that is guaranteed to be durable and last the test of time. The 100% polyester fabric is highly durable, comfortable, and very high quality. With that in mind, we can say that individuals will appreciate the overall value of this product due to the fact that it is also water-repellent and moisture-resistant. Another great feature to consider from this simple bag is the attention to detail in the carry handle and other elements of the item. The carry handle is durable and reinforced, while the zipper is fully functional, comfortable to use, and very high quality. With that in mind, this brand is known for their premium value, so individuals can expect this item to be very durable. Let’s discuss the price of this item! First, it is right in between the average price for many bags. However, it is not aesthetically pleasing, and it happens to just be a simple black polyester carry bag. If you want a durable bag that is very high quality, this is it. However, it is nowhere as stylish as other brands and other bags on our list. Overall, we recommend it if you want durability alongside simplicity. In the field of golf, golfers can attest that there is a wealth of different gear and equipment to purchase. Each piece of equipment has its own use and is effective, to say the least. This could not be truer for golf shoe bags. If you do not already own one of these products, it’s one of the best pieces of equipment to consider investing in. Reason being, these will not only help to transport your precious cargo, but they will also help to keep your footwear cleaner and lasting longer. Now, as we have explored, there are so many different types of products and choices. The best way to purchase the best product is to carefully prioritize what is most important to you. This is precisely what we did prior to picking the 10 products for today’s buying guide. To show an example, in the coming section, we are going to share our criteria used in choosing the top 10 products. Here, we will share the importance of looking at a few different aspects of these products – all of which may be important to you too! Let’s take a look. The whole purpose of these products it to make transporting your footwear easy, right? Well, as golfers, we really wanted to make sure that each product was designed with ease of use in mind. Furthermore, this is why the primary criterion that we evaluated each product on was how easy it was to carry. In this, we eliminated any products that were considered “heavy” or had an uncomfortable handle or grip to hold on to. Many of the products that we highlighted today came designed with patented grip designs, unique handles, and comfortable straps to carry. On top of all of this, we also looked at consumer reviews to see what people were saying regarding the longevity of the product. When picking out any product, always make sure that previous consumers are content with the durability of the product. Do know though that there will be biased reviews, trying to taint the product. You will need to weed out those comments and really focus on the truth. When we were coming up with a criterion to use in the evaluation process, one apparent aspect was the pockets and space of the bag itself. We understood that every golfer has different shoes and needs, and we wanted to ensure that each product that we shared was designed to hold just about any footwear. For example, whether you have wide feet or a size 15 shoe – we wanted products that could carry them. Additionally, we also focused on finding products that came with additional pockets and space to carry other important golf gear. During our research, we found that many bags came with additional space to carry golf tees, golf balls, and even one’s golf gloves or golf mitts. If you are looking for a multi-purpose product, look out for products that come with the additional space. If you are looking to ensure that you are purchasing a good product, one of the best ways to do that is by looking at consumer reviews. For today’s buying, we carefully looked at hundreds of different consumer reviews, ensuring that whatever product we featured was superior in craftsmanship, design, and comfort. Now, to do this, we did not only look at 5-star reviews. We branched off and looked at all stars, studying what all consumers were saying. In doing this, we needed to weave through a lot of biased comments. When purchasing any product, whether a golf gear or not, take the time to look at previous consumer reviews. In our experience, the best reviews that offer the most insight are those between 3-and-4-stars. Q: Is this easy to clean? Can you machine wash it? A: These are often typically easy to clean. In many cases, golfers can use a simple warm towel to remove easy stains. As far as machine washing goes, this really depends on the type of material that your product is made from. For example, if you selected an item that is made from nylon, you could wash it on a light cycle; however, you would not be able to dry it. The best thing to do is read the product’s label/tag to see what the cleaning instructions are. Q: Will this product fit my shoe? A; Great question! It may seem silly; however, not every single product is designed for all shoes. For example, some bags will only fit up to a size 9 or 10 in men’s – and others will fit up to a size 14. If you have a larger sized foot, take the time to read the product description to ensure the shoes will fit. You can also look at the dimensions of the back, measure your footwear, and come to the conclusion as to the fit. Q: What is the difference between water-resistant and waterproof? A: As you may have seen, there are two different types of products, those that are waterproof and those that are water-resistant. We highly suggest prioritizing waterproof products as these are better at preventing water from seeping through. Water-resistant products are still valuable; however, they cannot protect an individual from getting wet. In fact, if in the middle of a rainstorm, the materials will become saturated and can ruin quicker. Q: Can these be used for other purposes, such as carrying goods to work? A: Of course! These are great products that can be used for a wide variety of purposes. While their intent is for golf shoes, you can use this to carry items to work.